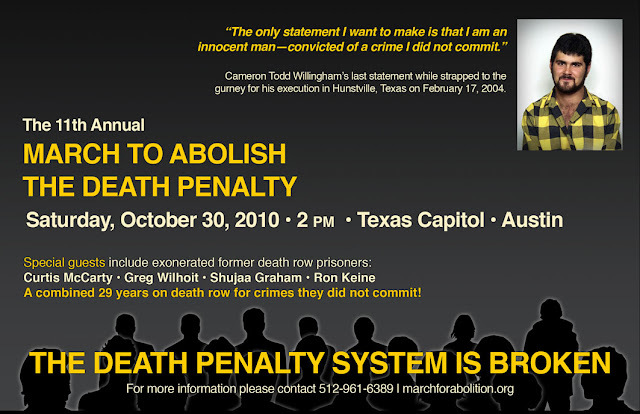 Six innocent, exonerated former death row prisoners will lead the 11th Annual March to Abolish the Death Penalty Saturday October 30, 2010 at 2 PM in Austin at the Texas Capitol on the South Steps at 11th and Congress. The exonerees are Curtis McCarty, Shujaa Graham, Ron Keine, Albert Burrell, Greg Wilhoit and Gary Drinkard. Together they spent almost 50 years under sentences of death in various states. The exonerees are attending the march with the help of the Journey of Hope…From Violence to Healing and Witness to Innocence. A press conference will be held on the day before the march Friday October 29 at 1 PM in the Speaker’s Committee Room (2W.6) in the Texas Capitol. The exonerees and other march speakers will be available at the press conference for media interviews. Also speaking at the rally will be the penpal of Todd Willingham who first investigated his innocence: Elizabeth Gilbert, who lives in Houston. The story of Gilbert’s role in the effort to prove that Willingham was innocent was told in the recently aired episode of Frontline “Death by Fire” as well as in the 2009 article “Trial by Fire” in The New Yorker. Todd Willingham’s mother Eugenia will deliver a pre-recorded video message to the march attendees. The video was taped on October 24 in her home in Ardmore, Oklahoma. It will be shown on a giant 12 feet by 9 feet video screen. She is not scheduled to appear in person. Another speaker will be Ron Carlson, whose sister Deborah Ruth Carlson Davis Thornton and Jerry Lynn Dean were murdered in Houston with a pick-ax by Karla Faye Tucker and Daniel Ryan Garrett. Ron opposes the death pealty and witnessed Tucker’s execution in Huntsville at her request. Scott Cobb of Texas Moratorium Network said, “Texas authorities from Governor Rick Perry to Chair John Bradley of the Texas Forensic Science Commission have done their best over the past year to delay, impede and prevent an official finding that Todd Willingham was convicted using flawed forensic science. Nevertheless, more and more Texans are now convinced that Willingham was wrongfully convicted. Former Governor Mark White said in Newsweek about Todd Willingham: “If there’s no arson, there’s no crime, and, therefore, he is innocent.” On Saturday Oct 30 in Austin, people from across Texas will gather at the Texas Capitol to say that executions in Texas should be stopped before another innocent person is executed”. Terri Been of San Antonio, whose brother Jeff Wood is on Texas Death Row sentenced to death under the Law of Parties for murder even though he did not kill anyone or intend anyone to be killed. The actual killer has already been executed. Sandra Reed, mother of Texas Death Row prisoner Rodney Reed, will also speak. Rodney and his family are fighting to prove his innocence in the 1996 strangling of 19-year-old Stacey Stites in Bastrop County. David Kaczynski, whose brother Ted Kaczynski is known as the Unabomber. David contacted the FBI with his suspicion that his brother might be involved in a series of bombings that caused three deaths and numerous injuries over 17 years. David is now Executive Director of New Yorkers for Alternatives to the Death Penalty. Bud Welch, whose 23-year old daughter, Julie, and 167 others were murdered in the Oklahoma City bombing by Timothy McVeigh that destroyed the Alfred P. Murrah building. Sandrine Ageorges-Skinner, whose husband Hank Skinner is on Texas death row. On October 13, 2010 the U.S. Supreme Court heard oral arguments in Skinner’s case to determine if he may seek testing of DNA evidence through a civil rights lawsuit. If he is not allowed to test the DNA evidence, then Texas may execute an innocent person. Bill Pelke, president of the Journey of Hope…from Violence to Healing. Bill’s grandmother Ruth Pelke, a Bible teacher, was murdered in 1985 by four teenage girls. Paula Cooper who was deemed to be the ringleader was sentenced to die in the electric chair by the state of Indiana. She was fifteen-years-old at the time of the murder. Bill originally support the sentence of death for Cooper, but went through a spiritual transformation in 1986 after praying for love and compassion for Paula Cooper and her family. He became involved in an international crusade on Paula’s behalf and in 1989 after over 2 million people from Italy signed petitions and Pope John Paul II’s request for mercy, Paula was taken off of death row and her sentence commuted to sixty years. Delia Perez Meyer, whose brother Louis Castro Perez is on Texas death row, will speak and will invite family members of people on death row to come to the front of the rally to be acknowledged. Marietta Jaeger-Lane, whose 7 year old daughter, Susie, was kidnapped, raped and murdered. Marietta asked that the mentally ill killer be given the alternative allowed in capital cases: a mandatory life sentence instead of the death penalty. The annual march is organized as a joint project by several Texas anti-death penalty organizations: Texas Moratorium Network, the Austin chapter of the Campaign to End the Death Penalty, the Texas Death Penalty Abolition Movement, Texas Students Against the Death Penalty, Texas Death Penalty Education and Resource Center, Death Penalty Free Austin, and Kids Against the Death Penalty.